July 7, 2013 A Pandora’s box was opened in the Middle East in late May. 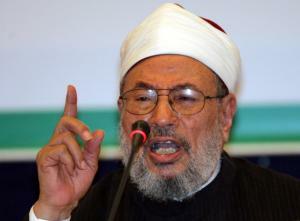 That was when Yusuf al-Qaradawi, the Egyptian theologian who is perhaps the world’s most influential Sunni cleric, called on Sunni Muslims worldwide to fight against the regime of President Bashar al-Assad and Hezbollah in Syria. In the weeks and months ahead, Qaradawi’s statement will surely quicken the stream of foreign fighters into Syria. Before long, Syria’s civil war could turn into an all-out sectarian conflict involving the entire region. The 86-year-old Qaradawi is a religious cleric who left Egypt for Qatar in 1961 and has since become something of a celebrity among Islamic religious leaders. He has authored more than 100 books that are sold across the Muslim world, and his weekly TV show on al Jazeera has tens of millions of viewers. Qaradawi owes much of his influence to his careful balancing of populism and political conservatism. He manages to combine, for example, hard-line views on Israel with vigorous condemnation of al Qaeda. He has built a reputation as someone who speaks truth to power, all the while retaining the privileges — such as a TV program and a professorship — that come with being close to the establishment. In some sense, he is the closest thing that the Sunni Muslim world has to a pope. Qaradawi’s controversial remarks fell at a Friday rally in Doha on May 31. In an emotional address about the plight of Sunnis in Syria, Qaradawi declared that ‘anyone who has the ability, who is trained to fight . . . has to go; I call on Muslims to go and support their brothers in Syria.’ That’s a remarkable message, precisely because it is one that clerics of Qaradawi’s stature almost never make. Establishment Islamic clerics often declare that a given armed struggle is a legitimate jihad, but they rarely say that Muslims worldwide have a duty to join it. Radical clerics have been known to make this so-called individual duty argument, which consists of saying that all able Muslim men must fight and that declining to do so would be a sin. But mainstream clerics such as Qaradawi usually make the ‘collective duty’ argument, which implies that outsiders can fight under certain conditions but with no obligation. Even at the height of the very popular Afghan jihad in the 1980s, the Saudi Sheikh Abd al-Aziz bin Baz said only that Muslims have ‘a duty to support’ — not ‘an individual duty to fight with’ — the Afghan mujahideen. He left it to more radical figures such as Abdullah Azzam, the ostensible mentor of Osama bin Laden, to argue that all Muslims had to fight. As is usually the case with academic reports on Youssef Qaradawi, the author fails to identify the full scope of his extremism. Qaradawi is the most important leader of the Global Muslim Brotherhood and is the de facto spiritual leader of the movement. He is also considered to be the “spiritual guide” for Hamas and his fatwas in support of suicide bombings against Israeli citizens were utilized by Hamas to justify their operations. In 2004, Qaradawi turned down the offer to head he Egyptian Brotherhood after the death of the Supreme Guide. He is based in Qatar and has said the Qatari Emir has protected from being designated as a terrorist by the U.S. He has also reportedly amassed substantial wealth by serving as the Shari’ah adviser to many important Islamic banks and funds. Qaradawi is the head of the Union of Good (UOG), a worldwide coalition of charities helping to raise funds for Hamas and is the leader of the European Council for Fatwa and Research (ECFR), the theological body of the European Muslim Brotherhood. Saying that he wants to end his life “in the service of Jihad” by visiting Israel and throwing a bomb, becoming a “martyr” in the process. Calling for attacks on US troops and civilians in Iraq along with Hamas, Islamic Jihad, and Hizbullah. Qaradawi been banned from entering the US since 1999 and UK since 2008. Last year, authorities also refused him entry into France. For a more extensive profile of Youssef Qaradawi, go here.